- The composition is a bit too narrow, I think: since the duck is moving to the left, I would like to see a bit more to the left too. This usually gives me a better feeling of the subject. - The motion isn't particularly speedy here, so it is probably less spectacular than other shots in the contest. - The light isn't too good, I am guessing this was a cloudy day? Always tricky... and installing flashes near the subject is not always easy. Just my 2 cents, hope this helps. I love the smoothness of the capture. 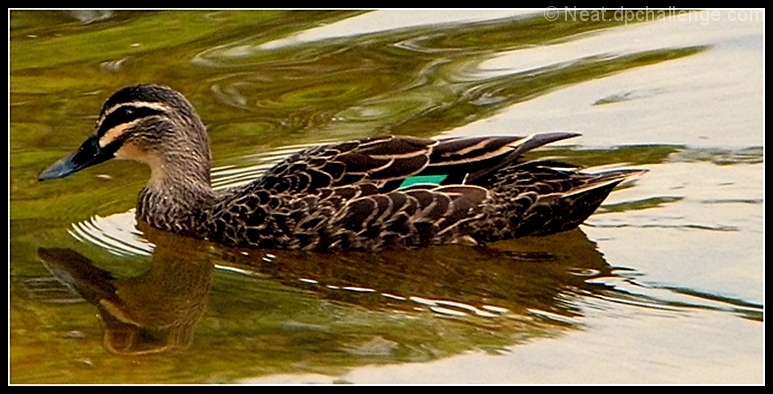 The only thing that is bugging me (and I am not deducting because of it) is the green in the middle of the duck. I don't know that I have ever seen a female with the green on her. It is just a bit distracting because it is SO green compared to the rest of the shot. Proudly hosted by Sargasso Networks. Current Server Time: 04/23/2019 03:52:37 PM EDT.